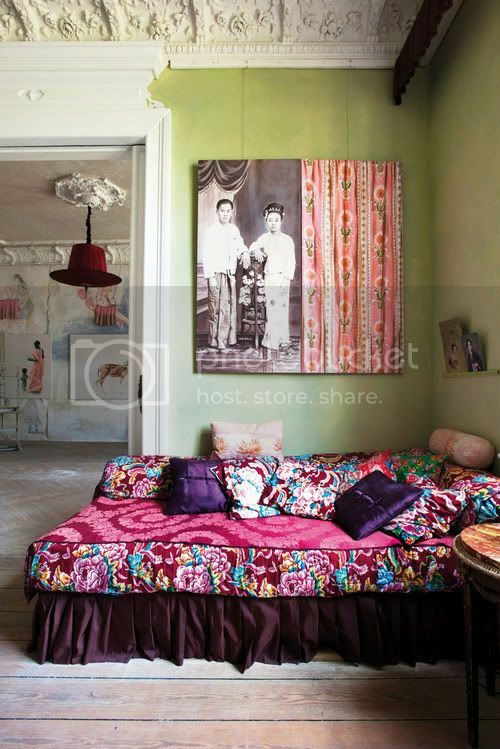 I am seriously digging this colorful, quirky home in a major way. From the painted ceilings to wall hangings and full-on saturated hues as accents and some as focal points, I can't stop looking at the details! After a week of being sick in bed, this is just the interiors inspiration that I needed to come across today. It also didn't hurt that my book made it on the bestseller list over at the Wall Street Journal at #2, Eek! I am so happy (thank you guys so much!). 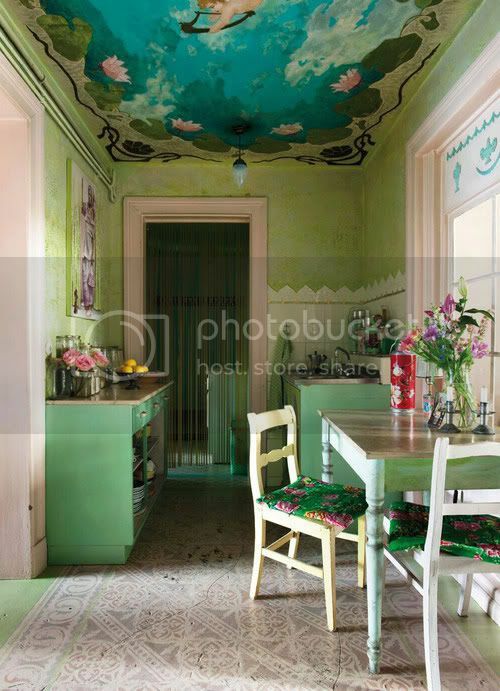 Between that extraordinary news of now authoring a best selling book and this fab home that I stumbled across below, I'm in 7th heaven (no reference to the kitchen ceiling at all, ha ha!). But I'm not here to brag about my book, or simply show a few photos and be on my way. Oh no. I want to talk about this amazing home and some memories from my past that I want to share because these photos took me back to a very special farm... a special place in my childhood. And I want to somehow spark your memories in the process. 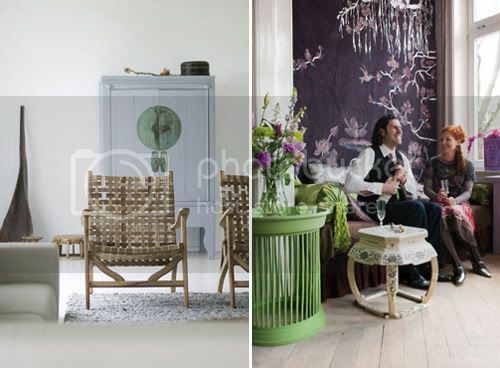 The moment I spotted this home on the Room and Serve blog and found out that it is actually from Vårt Nya Hem (Swedish) magazine, I had to dig deeper into their website to see what else they have featured that I might want to have a look at. I also tried to figure out why it felt familiar to me and then memories of the large farmhouse belonging to my great, great grandmother came flooding in and suddenly I was transported to another time and space. One thing that admire about this particular home shown in Vårt Nya Hem magazine is that, even with all of the color and pattern, each item seems to have been carefully curated and restraint was shown in both the floor plan and overall styling so it doesn't end up looking like a massive interiors heart attack. I admire people who are this stylish, it's quite amazing really and I'd love to linger in this space with the homeowners and really get to know the story behind each piece as I'm sure they have delicious stories to tell of travel, adventure and even a bit of danger. I love that the floor above appears to be stenciled. How grand (and doable!). But yet, when I look at the kitchen I see a story from the pages of my own life. I'll tell you it, if you have a moment. You see, when I look at this kitchen I see the farmhouse that my Polish great grandmother owned in southern Rhode Island in the countryside. 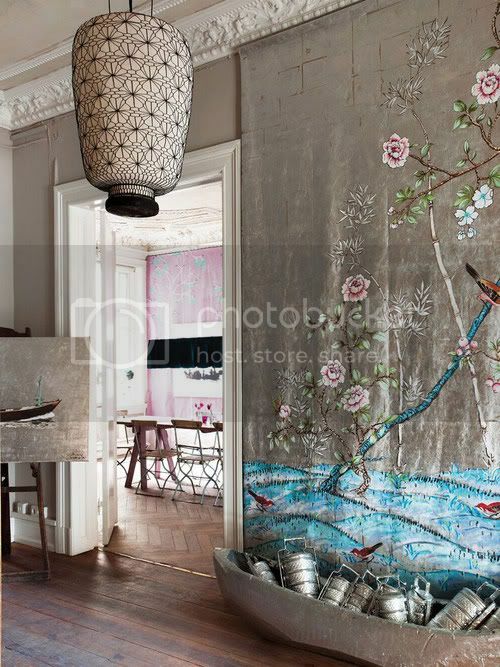 She had very ornate floral wallpaper, vinyl and tile flooring, art nouveau touches, extremely colorful everything... and the layout was the same with the old-fashioned style of cabinetry and such. She moved from Warsaw in the late 1800s to American to make her life in Rhode Island where she gave birth to my grandfather, raising him on a huge farm. Then, when he was in the military stationed in Chicago, he met and married my Irish/Scottish/Russian/Polish grandmother who was a cabaret singer there, and they made their life on the same farm in a coverted barn nearby where my mother was born and raised. I grew up visiting my grandparents on their farm, affectionately called "Baby Farm", as my mother's large extended family stayed there in the summers and someone always ended up getting pregnant - including my mother, with me! My grandfather's sister married an Italian man and so the farm went from being Polish to Polish-Italian so I remember how this mix of culture affected life on the farm. I also remember braiding bread for my grandmother and rolling out dough and baking pies in a kitchen much like the one shown above. I remember thinking that my very Polish great grandmother, who only spoke Polish to my grandfather when she didn't want us to know what she was saying (which was often), was extremely "different" because her decorating style was wayyy over-the-top. She didn't have the typical country farmhouse - it was vibrant and filled with antiques from Poland that she brought over and of course flea market finds as my grandfather loved going to them religiously on the weekends. I also remember him taking me to massive flea markets along with my mother. I think that's why I enjoy them so much today and am always on the prowl for a unique find. Growing up I remember loving my great grandmother's crazy farmhouse and enjoyed all of the color, pattern, massive floral wallpaper, taxidermy (oh yes), patterned floors, farmhouse sinks, minty green tiled bathroom, stacks of mismatched china in white cabinets with glass doors and the way the home smelled in the warmer months when all of the flowers were in bloom and the breeze drifted their heavenly scent through the home, usually through the kitchen where I was usually hanging out with my grandmother and great grandmother, and yes, my mom too. She lived to nearly 100 years old so I remember her in my life until I was 22 years old. I was lucky. Maybe you'll find some inspiration over at Vårt Nya Hem to motivate you on a home project this weekend? Or to connect you to bits and pieces of your past life or how you would someday like to live? It's important when you find photos that inspire you to then pinpoint WHY you are connecting to them. What is it? Perhaps a window to your past? Or simply the colors? The style? The casualness? Think about this whenever you pin an inspiring image to your moodboard - it's a great way to refine your personal style!